In a small pot, add olive oil and garlic and heat on medium-low. Cook 10 to15 minutes to infuse oil with the garlic. Take off heat and stir in lemon zest and salt. 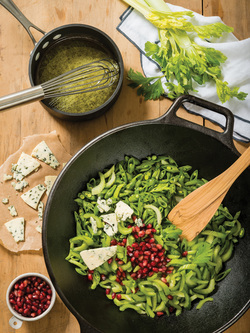 In a large bowl, add celery and peas, reserving celery leaves. Pour over warm olive oil and mix well. Season with salt and pepper. Transfer to a serving platter or shallow dish. Layer on cheese slices and scatter pomegranate seeds and celery leaves on top. Serve. * Use a bag of frozen peas if you don’t have fresh sugar snaps. The warm dressing thaws the peas. ** Prepackaged crumbled blue cheese works as an alternative to the blue cheese slices. *** If you can’t find pomegranate seeds, toss in dried cranberries and a handful of sunflower or pumpkin seeds for sweet crunch.